Panmana in Kollam district. Photo by Sreekesh Ravindran Nair. The coastline between Chavara and Alappad in Kollam district of Kerala, has a decades-long story of people’s battle for survival against mining companies. On a journey through this coastal belt, one can spot abandoned houses, temples, schools and many more buildings where people once lived. Red coloured ponds and dried up mangrove forests are another painful sight on this coastline. This stretch in Kerala is where the extensive mineral beach sand mining has been happening since the 1960s. The abandoned buildings are the remains of people’s failed agitations and indefinite strikes. One by one the villages in the area are vanishing from the map of Kerala. A village named Panmana has turned in to a heap of sand and an abandoned temple stands around which thousands of fishermen once lived. In Alappad panchayat, activists estimate that more than 6,000 fishermen families have vacated over the years due to beach erosion, drinking water scarcity and lack of fish availability. Sooner or later the panchayat will also be turned in to a sand bund, remaining residents say. Kovilthottam, another village on the coastline, also has only 50 families left. “In 2010 almost all indigenous communities were evicted from Kovilthottam region in Chavara, promising that they will be allowed to rehabilitate back in their own land after completing the mining within three years. Even eight years after those evictions, no rehabilitation has occurred, more than 500 families are homeless,” said Robin an activist in the locality. 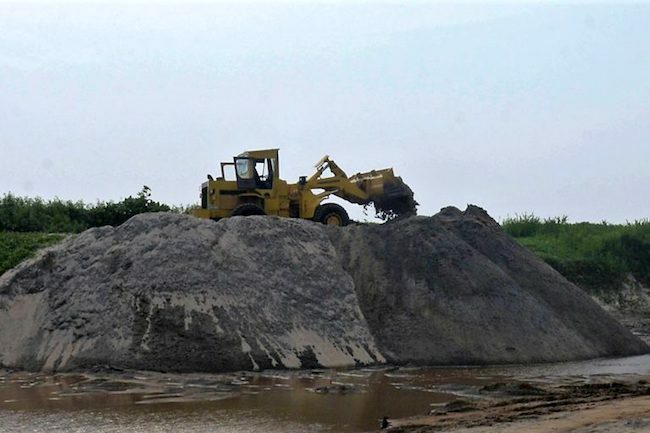 The remaining families in this 23 kilometres stretch of coastal region (Kollam Neendakara to Kayamkulam) are under the threat of eviction; for the last few years, they have been expecting a massive coastal erosion that can engulf their villages. Most of the people have been forced to leave their houses, even without any compensation from the authorities or the mining companies. And for the past 72 days, starting November 2018, the remaining people in Alappad and nearby areas have been on an indefinite strike against mining companies planning to extend their projects. Photo by Sreekesh Ravindran Nair. The presence of the minerals ilmenite, rutile, zircon, monazite, leucoxene (brown ilmenite), sillimanite and garnet in coastal sand dunes of Kollam was discovered in 1920s. Two public sector companies, Indian Rare Earth (IRE) which comes under central government and Kerala Minerals and Metals Limited (KMML), a company under the state government have been mining since 1968. Though by 1995 many foreign companies had tried mining in the coastal area, continuous protest from the public and activists forced them to drop the projects. IRE and KMML still continue to do extensive mining in the area irrespective of people’s protest. Since the companies have got clearances from respective departments of state government as well favourable orders from the High Court of Kerala, the opposition voices are silenced. There is no data on people who were evicted without any compensation for their loss and no enquiry about polluted drinking water sources of this coastal belt. Though activists quote the numbers of families vacated from the region, there is no official data on it. In Chittoor region near Chavara there are open ponds which have been used by companies for dumping chemical waste. It has been years since the residents there stopped using these drinking water sources. After repeated agitations the companies started providing drinking water to the residents in Chavara region, but not regularly. “Once in a while the companies distribute drinking water, otherwise I have to stand on a queue for long time to get water from the public tap. The tap is far from my house and have to walk all the distance with pots of water,” said 78-year old Mary, who lives in Chavara. She recalls how drinking water and other resources were abundant in the area once. Mary, who lives in Chavara, remembers the time her village had abundant natural resources. Now she has to walk a distance with her pots and wait in queue for water. Photo by Sreekesh Ravindran Nair. “We used to get fresh well water. Moreover, the fish availability was abundant here. Now what we have is water scarcity and poverty. Though it is painful, I want to leave this place where I was born and brought up. But where will I go. If the companies give a good compensation I will move somewhere,” she added. Massive coastal erosion is another effect of the mining. The worst nightmare for the remaining residents in the area is of the sea engulfing their habitat. “According to litho map of the area, in 1955 the Alappad village’s area was 89.5 kilometres square. Now it is just 8 kilometres square. So we are sure that our village will be sooner or later vanish, but we continue our agitation for neighboring areas like Onattukara, Upper Kuutanad, Arattupuzha etc, which are in Alappuzha district. They have submitted their proposal to extend their mining which will lead to the destruction of coastal region of two districts Kollam and Alappuzha,” Sreekumar KC, environmental activist and resident of Alappad told Mongabay-India. In some areas of Alappad one can spot two parallel roads in the sea shore, one is partially broken. “The latest road is the fourth or fifth one constructed, as each time coastal erosion happens they construct another road,” Sreekumar said. He also pointed at a study done by National Institute for Interdisciplinary Science and Technology (NIIST) where it is shown that how shoreline has occupied the land from 1968 to 2017. “The map shown in the study clearly shows the extension of coastal erosion,” he added. Sreekumar said that from Panmana towards north, the coastal region was the habitat of sea turtles. That was area where they laid eggs. Now they have disappeared. “Apart from that this was an area where we get high quality prawns in Kerala. With this massive mining and coastal erosion, all these are just memories for us,” he recalled. Unnikrishnan, a panchayat ward member of Alappad recalled that many of the houses were not in the sea shore few years back and now all of them are close to sea. “The houses you see here were one or two kilometres away from the sea. Now they are hardly 400 to 500 metres away. Fish availability is another issue. Prawns, shell fish and various other small fish were available here in abundance, but now fishermen are forced to leave here due to poverty,” he said. Janet’s family is one among the 50 families remaining in Kovilthottam near Chavara. “We can’t bear the pain of leaving our home and whatever we earned. But how can we live here without job, without water and under constant threat of coastal erosion. Anytime our house will be under the sea,” she said. Robin, the resident from Chavara, said that the mining companies had earlier promised jobs and rehabilitation to the locals who quit their traditional occupation (fishing). But they still haven’t received anything promised by the companies. Prominent environment activist and writer C.R. Neelakandan reminds that Alappad was the worst affected coastal area when the 2004 tsunami hit Kerala. “The shoreline difference is almost seven kilometres over the years in that area. The sea had occupied land at a width of seven kilometres. The state government has notified that people in the area need not pay the land tax. That means there is no land existing there, it is under water now,” he said. He also pointed that there is a backwater there, which was identified as national waterway. “But soon sea will evade these backwaters too and we will lose that waterway,” he said by adding that irrespective of all this loss, India has not benefitted much from this mining. “Monazite and ilmenite are the main extracts from this mining. The full processing of these minerals doesn’t happen in India. We export rutile mineral. So the main profit is for foreign companies, so technically our country does not benefit much,” he said. He said that none of the issues in this particular region was studied by agencies. “There were three communities living in this area, all of them were wiped out. In Panmana almost 700 hectares of land were lost,” he pointed. He also talked about the necessity of a strong protest against these companies extending their mining projects to Arattupuzha in Alappuzha district. “What happened in Chavara, Alappad and Panmana will be repeated in Alappuzha too, at least that should be prevented now,” he added. Alappad activist K.C. Sreekumar meanwhile said a proper study is needed in the area. “Government and other institutions should conduct a proper study in this area, rather than giving blatant clearances for mining. They should survey the coastal erosion, enquire what happened to the people who left here, what happened to the fishing community and why the water sources here got polluted. Everything should be studied properly, so that we could save remaining villages at least,” he said. Writer-activist C.R. Neelakandan also emphasised the need for a study. “There can be radioactive emissions through these unscientific mining and many health hazards can be an after effect. No environmental studies have been done yet over the pollution and hazards of this mining,” he said. This was first published on Mongabay on October 22, 2018 and was republished with permission.